Locks break for a variety of reasons ranging from jammed bolts, malfunctioned locking mechanisms and worn combination wheels. It is possible to open a broken lock by using a method that best suits the type of lock and the type of break. A locksmith can usually remedy any broken lock situation, but amateurs can attempt it themselves first in order to save the expense and hassle of hiring a professional. However, opening a lock without the owner's consent is illegal. 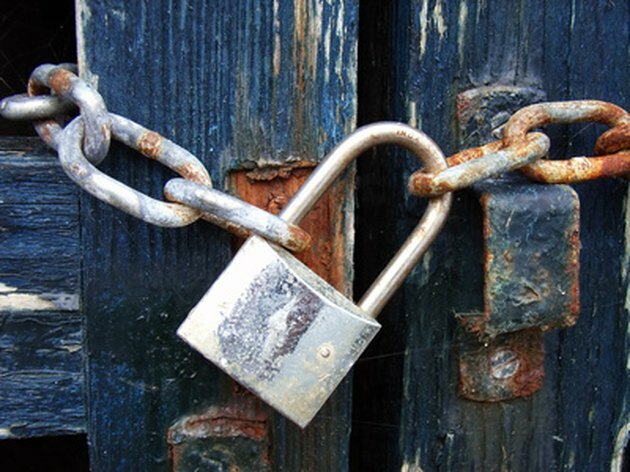 Breaking open a padlock can require repeated force with a hammer and screwdriver. Spray the mechanical lubricant into the keyhole and the padlock bolt. This process can remove any debris that may be blocking the key from entering and/or turning properly in the keyhole. Insert the tip of the flathead screwdriver into the space where the padlock bolt enters the main part of the padlock. Jam the screwdriver in as far as it will go, then tap it with the hammer using a fair amount of force. Continue to do this until the bolt releases out of the padlock. Slide the flathead screwdriver into the side of the plastic, numbered part of the combination lock and press upwards to pop this cover piece off. This should reveal where the lock latches. Wedge the screwdriver tip in this spot and lever it upwards to snap the latch open. Hit the bolt portion of the padlock with a hammer at the point where the bolt meets the round combination portion of the lock. Repeat this process until the bolt eventually releases from the rest of the lock. Cut the bolt part of the padlock or the combination lock with bolt cutters. Use the bolt cutters that best fit the size of the lock's bolt. Work the bolt cutters back and forth, like scissors, until they eventually cut through the bolt.